The Lunar New Year is coming, bringing the prospect of good luck and great fortune. After last week, we all need something inside that proverbial big red envelope. If you’re NYPD Officer Peter Liang, you have to be wondering about your luck when your case just happens to come up after district attorneys in Missouri and New York failed to prosecute two cases involving the police shooting deaths of two African Americans, which sparked massive nationwide protests. Liang definitely was in the wrong place at the wrong time. Liang was indicted last week on second-degree manslaughter charges for a freak shooting in which a ricocheted bullet killed Akai Gurley in a Brooklyn high-rise. A rookie cop on the force less than 18 months, Liang reportedly had his finger on the trigger and was pointing his gun into the dark–a violation of his safety training. More importantly, there doesn’t seem to have been any threat. With no identifiable threat, it’s difficult for Liang to argue self-defense. Liang did not testify before the grand jury, and his partner was granted immunity to testify against him. The stars are not aligning. We’ll see if any new facts in Liang’s defense come out at trial. But for now, the existing facts, combined with the “uber” facts, appear to make this case set-up on a tee for reform-minded Brooklyn district attorney Kenneth Thompson. With the way people feel about cops and DAs’ failure to prosecute them, the political winds appear to be behind him. And somehow Lady Justice seems to be holding both a scale and a kite. Markus Kaarma’s case is a little different tragedy. It’s not about police, but about a private individual taking the law into his own hands and relying on Castle Doctrine laws to justify killing an unarmed person. It was vigilante justice. And Kaarma was wrong. You may have heard of Kaarma, 29, a Korean American from Montana. His case didn’t get a lot of play nationally last week, perhaps because he was convicted of deliberate homicide last December. But his recent sentencing hearing was quite a shocker. Kaarma thought the Castle Doctrine gave him the right to shoot to kill in order to protect his home. Instead, he was sentenced to 70 years in prison for murdering Diren Dede, a 17-year-old German exchange student. “You didn’t protect your residence, you went hunting. And here you have a 12 gauge shotgun that’s loaded. Not to protect your family, but to go after somebody,” said Missoula District Judge Ed McLean on Feb. 12. The sentence was a surprise. But so was the prosecutor’s initial decision to go forward and charge Kaarma in the first place. That’s been my experience with DAs when it comes to self-defense cases in which the Castle Doctrine is invoked. 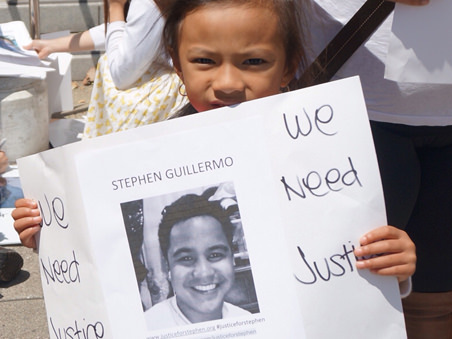 It happened in the case of my cousin, Stephen Guillermo. I’ve written in this space about Stephen numerous times. And from a victim’s point of view, there are some similarities in the Kaarma case. Stephen went by mistake to the wrong apartment in his building. The apartment was not his but that of an African immigrant, a retired security guard. Witnesses said they heard no break-in. If so, the door may have been opened so that an unarmed Stephen walked into the apartment and was shot to death by the armed retired security guard. In Montana, Kaarma left his garage door open, hoping his suspected teenage prankster burglars would come in. When they did, motion detectors alerted Kaarma, who then fired a shotgun four times killing an unarmed teenage intruder in the garage. Many DAs feel just having a dead body in the house makes the Castle defense unbeatable. But I’ve always argued that the shooter still must show that he acted reasonably in using deadly force. Now that Kaarma’s Castle defense failed and his 70 year sentence issued, I’m beginning to feel this could be a breakthrough moment. Not necessarily for my cousin Stephen’s case. The San Francisco DA George Gascon had arrested Stephen’s killer, refused to prosecute, and let him go. No, my hope is that Kaarma’s conviction and sentencing will set the example to rework the homicide laws so that DAs don’t see going up against the Castle defense as a defeat. Prosecutors want to have a winning record. Preferably a win in every case. Last October, I asked DA Gascon what he needed in order to prosecute anything. Or “just believe you can win,” a form of political will. When I mentioned challenging the Castle doctrine, Gascon said individual cases weren’t the place to take ethical, moral, or courageous stands. Well, Castle really doesn’t work either. Not if you want to prevent innocent people from being killed. Gascon may have quivered before the Castle Doctrine in the past. But now maybe he’ll take a stand–not for my cousin’s individual case–but for future victims who could be murdered by vigilantes who want to use their guns whenever feel threatened in their home. Even if they’re wrong. The Lunar New Year is coming. There’s always hope.